Depression. 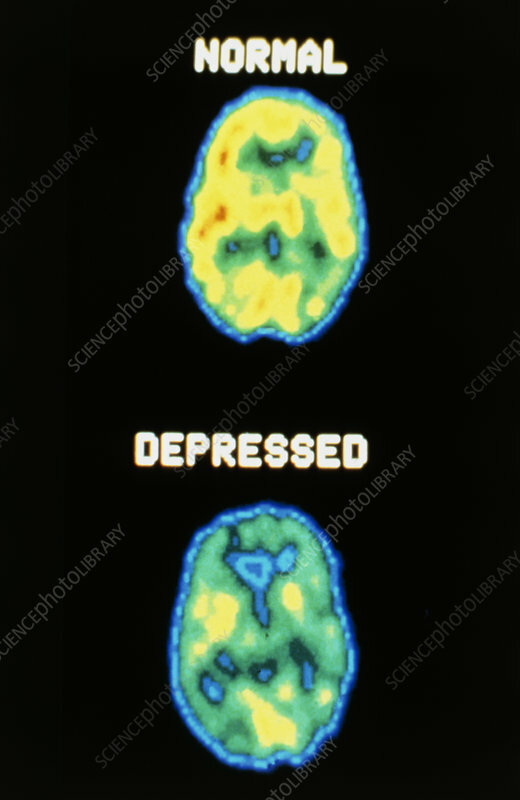 Two axial PET scans of the brain, comparing a normal subject (top) with a person suffering from a depressive illness. The depressed patient shows lowered brain activity. PET scans (Positron Emission Tomography) obtain details of the function of tissues using tracers labelled with a short-lived radioisotope. Here, a glucose analogue labelled with oxygen-11 is injected into the bloodstream immediately prior to taking the scan, crossing the blood-brain barrier to participate in glucose metabolism in the brain. Positrons emitted are detected and data processed to provide the colour-coded images.